Every year Lexus makes a holiday pitch to give its vehicles as Christmas gifts. As improbable as that seems for most of us, never the less they have something to say about who might be able to so casually gift an expensive automobile. And surprise - our generous gift giver is a family with a modern house. And why not. Lexus wants us to envy these folks, they want us to want to be like them - buying a new Lexus by Christmas time. And who do they think will make us feel that way? The guy with the modern house, of course. They know the modern house will make their product look more desirable. Yet the US housing industry doesn't get this, do they? What's with that? It appears from trailers released in Europe that the upcoming Tron Legacy movie will use a modern house for the home of its protagonists, the Flynns. I'm not sure if the home was ever shown in the original Tron movie, I think not, which means that this is a current appropriation. No doubt the movie makers turn to the modern house to imbue their heroes with the sense of cool the audience will admire. Of course we all understand the cool guy lives in the modern house. America's home builders, do they get it? Hmmmm.. not so much. 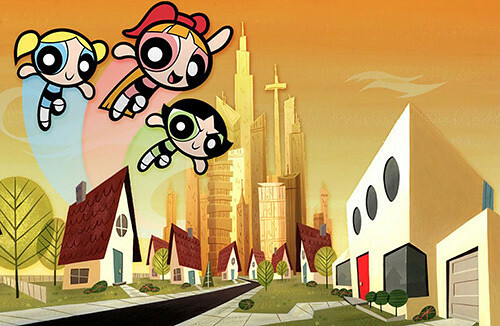 The PowerPuff Girls are so rocking a Modern House!